I have very fond memories of my maternal grandma and grandpa. They were very important and influential people in my life. I thank God for both of them and for the time I was able to spend with them before they passed away. Both of these hardcover books are twenty pages with the words told in rhythmic form. 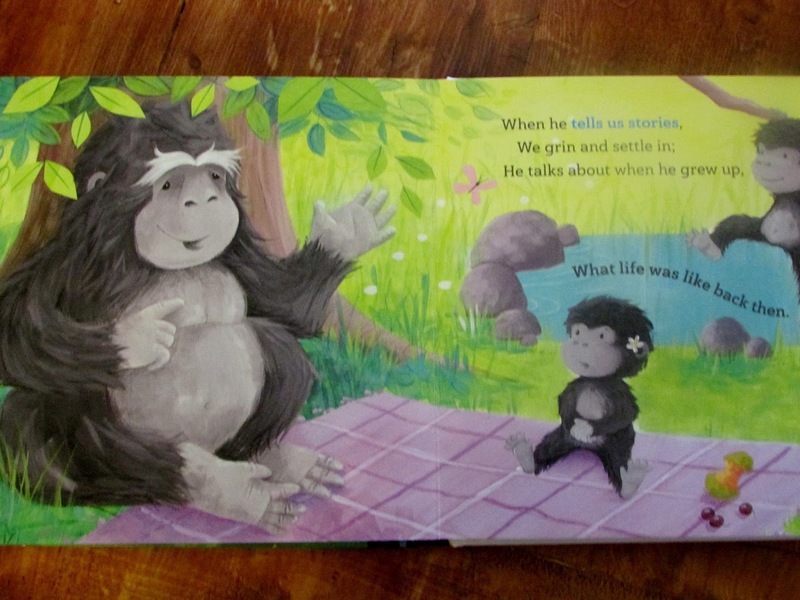 Thank You, God, for Grandpa shows adorable illustrations of a grandfatherly gorilla with his grandchildren. Throughout the pages, the animals are shown playing ball, telling stories, and going fishing. Thank You, God, for Grandma is illustrated with bears. The grandmother bear plays hide-and-seek, shares secret recipes, and sings soft, sweet songs. These books are darling and would be perfect as a way for a grandparent to read to their grandchildren and discuss the special bonds they have. One person will win a book copy of Thank You, God, for Grandma and a book copy of Thank You, God, for Grandpa. I have 3 grandchildren. My other son gave me 2 more that were almost grown. They are all my heart. I have no grandchildren yet, but I am hoping to have a few some day! We have two delightful grandchildren. I have a three year old who is my mom's only grandchild, so this would be for my mom. I have 5 grandsons. Their ages are 9, 7, 6, 1, and 5 months. They all are big Nanna boys. I love them all so much. They are my joy. I don't have any but three young boys are my grandkids by choice. I am so blessed,,i have 14 grandchildren,,the youngest is 18 months and the oldest is 17yrs and just found out we have another grandbaby on the way due Thanksgiving! I have two sweet grandchildren - ages 2 and 4! We don't have any grandkids. A little too young for that! I have been blessed with 3 beautiful grandkids!!! None. My parents have eleven. I don't have any grandchildren. I have two grand children and one is such a bookworm. We have 2 grandsons that we love to read to. These books look so cute! I only have one grandson so far. I have two delightful grandsons. I have one adorable granddaughter. I don't have any grandkids, b I have a son and a daughter. I have one beautiful grandson. I do not have any. My son is 6 and my daughter is 3. I don't have grandchildren yet, but my fingers are crossed! I have 5 grandchildren! Three girls and two boys. I don't have any grandchildren yet . I don't have any grandchildren but if I won I would let my daughter (7 yrs old) give this to my mom & dad for Christmas! i do not have any grandchildren yet. No grandchildren, but my daughter would love to give this to hers! Thanks so much for the chances to win. I have been blessed with two grandchildren, one was even born on my birthday! As each before me agree that grandkids and wee ones that we are around are all blessings! As of late November I am lucky to have 5 (all under 4) and look forward to any others! I don't have any grandchildren so I would gift this to my niece from her grandparents.